Thule’s top level iPhone 6/6s case has been designed to offer the most protection for your phone by meeting or exceeding waterproof, dustproof, and shockproof industry standards. It’s a maverick in both form and function which is on par with what you would expect from Thule. Thule’s motto is “Active Life, Simplified” – a slogan aimed at everyone from a family with young kids looking to get away for the weekend, to extreme sports superstars who routinely don a flying squirrel suit and sail off the side of a building. So I wasn’t in the least surprised when I opened the packaging to their Atmos X5 and found this beast of a phone case. But did it meet Thule’s claims about being water and dust proof? How about being able to be dropped from six and a half feet? In similar models from the competitors, we have seen issues with sound quality and loss of other key functions. Would we find the same to be true here? The installation of the iPhone 6s into the case was simple, quick and easy, requiring the user to simply slide the phone into the case, snap the front on, and flip the four latches that keep the whole thing together. The case comes with detailed instructions which I recommend you read thoroughly to insure your phone is correctly installed and fully protected. Removing the iPhone 6s from the case was a bit challenging. This was mostly due to the tight fit of the Atmos X5, and may only affect the 6s, which it is slightly thicker than the iPhone 6. Thule claims that the X5 meets IP68 waterproof and dustproof standards – which require a serious attention to sizing and build quality in order to pass. They also claim the case can be dropped from 6½ feet without damage to the phone. Did the case live up to those boats? I filled a bowl with water and sunk the case in it – holding it in place for 5 minutes (which is much longer than it would be kept under water for in a real life situation). I then removed the case, wiped it down and began the opening process. Though there was water under the latches, no water got inside the case itself. For this test I dropped a trowel full of soil onto the case, wiped it down, and then opened it up and wiped the inside down with a wet paper-towel to see if I would pick up any of the dusty dirt; It did not. The inside of the case was fresh and clean. I went real old school for this one and just held the phone up and dropped it a bunch of times. There was no obvious damage to the case, but the real test would be submerging it in water again to see if anything was out of whack or cracked: I did, and still nothing. The X5 remained dry as a bone inside. The Atmos X5 has a built-in screen protector which floats a millimeter or two above the phone screen. As a result, more pressure is required to get a response from the touch-screen. Additionally, it makes the Touch ID a little trickier to use too. This is a common theme with competitor’s cases which feature a built-in screen protector as well, but it is important to point out none the less. Unlike similar cases available for the iPhone 6/6s, both the headphone port and charging port are oversized allowing you to use most headphones without the need for an adapter and most aftermarket Lightning cables to charge the phone. The volume and power buttons are oversized to work with both bare and gloved hands, which is a nice feature. They function very well when you’re using two hands, but if you have the phone in a hands-free cradle in your vehicle more force is required to adjust the volume. A common complaint about rugged iPhone cases is that they are so over-built in size and shock dampening that it distorts the sound coming out of the speaker and going into the microphone. Though there was a slight muffling of sound with the Atmos X5, when compared to a naked iPhone, it wasn’t as severe as other cases I have used. Because of its size, the Atmos X5 is best suited for folks who are exposed to the elements or are highly active in the outdoor world. It is built like a bomb shelter so it is perfect for construction workers, engineers, firemen, or police men. It also provides a nice level of protecion for anyone who doesn’t have the general luxury of being inside a climate controlled room with plush seating most of the time. The Thule Atmos X5 iPhone 6/6s case meets the waterproof, dustproof, and shock proof standards the company claimed it would. I believe this is due in large part to the awesome latch system they have designed in to keep the case intact, and wrapped around the phone. Thule has integrated style into function by having differing surfaces on the case that make it look modern but also improve your grip on it as well. Additionally, you don’t need any adapters or proprietary cables to use your headphones or charge your phone with this case. That may seem like a minor detail, but it is one that is much appreciated. The response reduction on the screen and the Touch ID may bother some users, but when weighed against the level of protection you’re getting – and seeing that this is common with other rugged cases – I didn’t see it being a deal breaker. 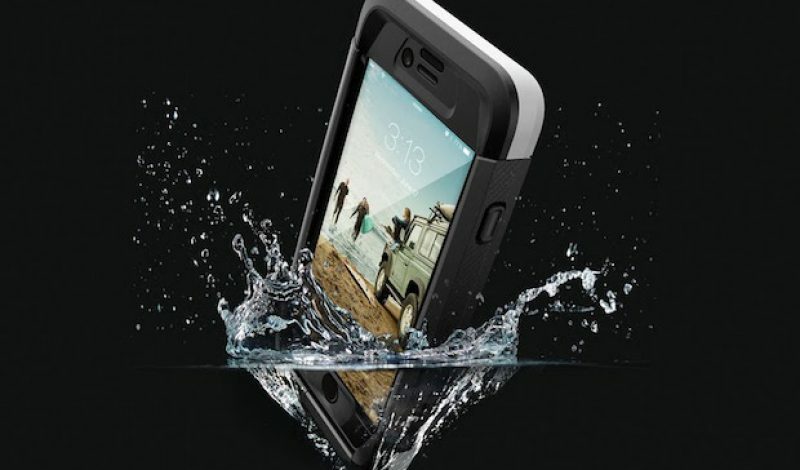 Overall, I am impressed and think that Thule really has a shot at the crown in the world of rugged phone cases.